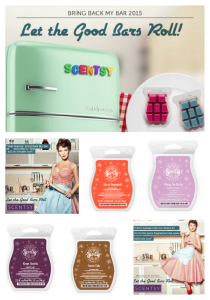 Check out our current Scentsy Bar Fragrances here. Banana Nut Bread – Scentsy Banana Nut Bread Bar: Right from the oven with ripe bananas, nuts, and spices. Carrot Cake – Irresistibly sweet, nutty, warm, and spicy, just like carrot cake. Cherry Almond Pie – Orville’s favorite dessert. Graham crackers, sweet almond, cream, and cherries. Cherry Vanilla – A delightful swirl of candied cherry and sugared almonds folded into velvety white chocolate ice cream. Go-Go-Goji – An exotic blend of tart Chinese goji berry, sweet lotus flowers, and ripe, warm dewberries. Grandma’s Kitchen – Nuts, raisins, butter, and spice always make Grandma’s kitchen smell nice. Grape Granita – Sun-warmed grape and pineapple with undertones of honeysuckle. Happy Go Lucky – Captures the exhilaration of a new romance with luscious red berries, silky orchid, and Japanese plum floating on a cloud of amber vanilla. Hemingway – Rich, ripe apples and warm, woody accents of sandalwood and cedar with hints of spice. Hendrix – An electrifying blend of earthy patchouli, glowing sandalwood, and bold pink pepper, harmonized with sweet tobacco flower. Mulberry Bush – Sweet mulberry accented with bittersweet orange peels. My Home – Spicy cinnamon and floral scent – a must try! Oats & Honey – Bursting with a buttery mix of toasted oats and honey, oven-crisped with vanilla and maple. Puppy Love – Sweet pea blossoms on a background of velvet musk. Red Delicious – Crisp, juicy apples, fresh from the orchard. Simply Irresistible – Lavender with a strong, woody background of amber, moss and musk. Simply Rose – Enjoy the lush, romantic aroma of this elegant flower whenever you desire. Spiced Grapefruit – Mandarin and bergamot citrus perfectly balanced with spicy coriander, nutmeg, and allspice. Watermelon Patch – Sweet, vine-ripened watermelon. Wild Black Cherry – A sweet and juicy black cherry, like an old-fashioned black cherry soda. 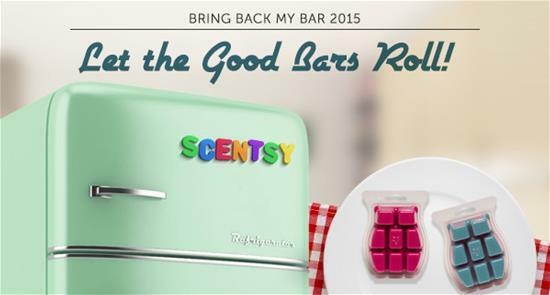 Scentsy Bring Back My Bar fragrances are available Jan. 1-31, 2016, only — stock up while you can!